For centuries, driven by admiration and rivalry, artists have influenced one another. Rembrandt is regarded as one of the world`s greatest artists, but even he sought inspiration in the work of others he admired. He was a great lover of the work of the eccentric Northern Netherlandish landscape painter and printmaker Hercules Segers (1589/90-1633/40). Segers is one of the most intriguing figures of the Golden Age. Rembrandt was fascinated by his paintings, and the experimental nature of Segers`s prints certainly encouraged him in his own printmaking. He shared his fascination with Segers with his pupils and other artists in his circle of friends. There was a revival of interest in Segers`s work at the beginning of the twentieth century, and several printmakers used it as an example in their teaching. The eminent British printmaker Stanley William Hayter introduced Segers to artists in Paris and New York, Max Ernst among them. There are contemporary artists, too, who see Segers as a unique source of inspiration. This subject has never before been addressed in a book. 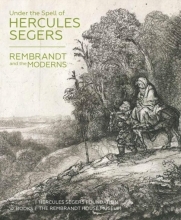 Under the Spell of Hercules Segers: Rembrandt and the Moderns, with beautifully illustrated essays by Mireille Cornelis, Eddy de Jongh and Leonore van Sloten, accompanies the exhibition of the same name in the Rembrandt House Museum.